Last weekend I traveled to Maryland for a family wedding. 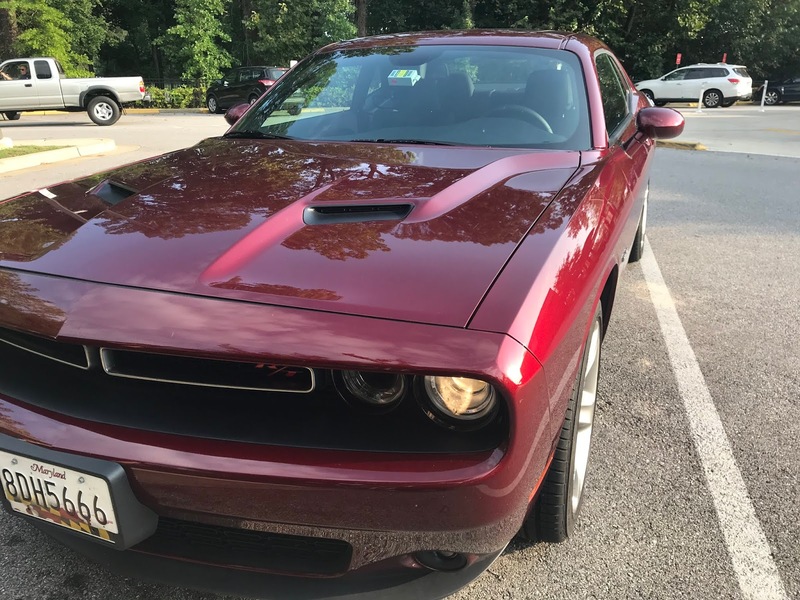 When I was arranging this trip, I decided to have a little fun and reserve a Dodge Challenger for my rental car (we paid for the airline tickets with miles, so we had extra in the travel budget). I assumed I'd get one with the V-6 engine. That has 306 horsepower which is good but not a whole lot. Plus, after renting a Mustang V-6 a few years ago that was supposed to have about 300 horsepower, it didn't feel as if it had 300 horsepower, so I assumed rental car companies "de-tuned" engines to produce less power. So I was surprised when I walked to the car and there was a "HEMI" designation on the front fender. 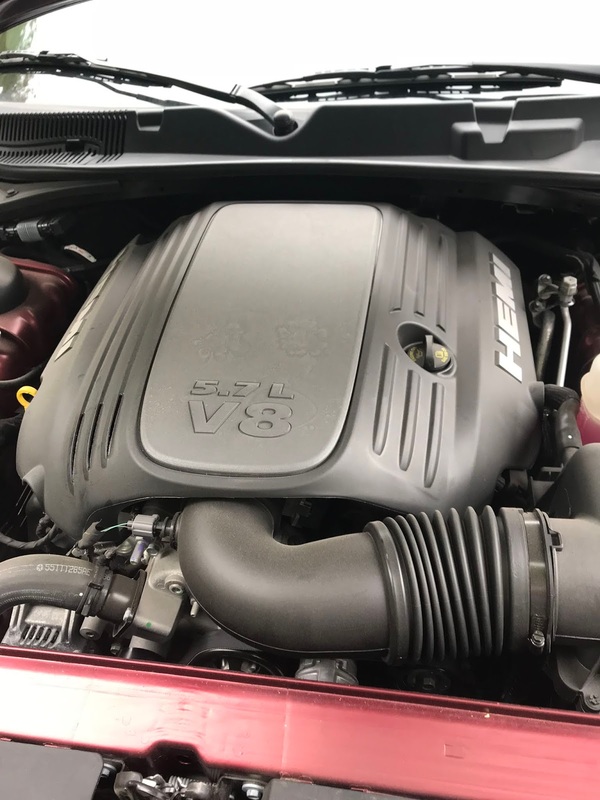 The HEMI is a V-8 engine known for making power, in this case 372 horsepower (with an automatic transmission; with a manual it makes 375). The color was unique, I thought, a very pretty burgundy except in sunlight it looked more red. My wife determined through Google that it was called "Octane Red." explore that power much because of traffic (lots and lots of traffic). But I did once in rural Maryland "floor it" and the car accelerated nicely. And I once accidentally chirped the rear tires. The interior was comfortable for two. But if more than that, it was difficult to put adults in the back seat (in a nor'easter downpour no less). But the sound of the car was melodious. Even at idle the exhaust sound was lovely. When accelerating, it was orgasmic. 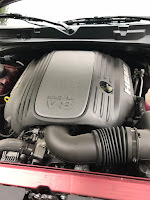 The engine is the same 5.7 liter V-8 that was in my old Chrysler 300C. But with this car, it had less mass to move (even though the Challenger is built on the same frame as the old 300C). The interior gauges were both modern and retro. It had one thing I like in cars, an indicator that your headlights are on while driving. But there are some downsides. The aforementioned worthless backseat for adults is one. To put things in the trunk, you have to lift them very high. And one of our suitcases was big and heavy. The eight-speed transmission was good most of the time, but when you were cruising, it went to 8th gear to save fuel (I assume). If you pushed on the gas to accelerate, it would lug the engine before it would downshift. This was disconcerting in traffic when you needed to respond quickly. And thanks to the wide C-pillar (there were no B-pillars), there was a horrible blind spot. I felt as if I were taking my life into my hands nearly every time I changed lanes. But, over all, I enjoyed driving the Challenger R/T. It was fun. And that exhaust note was so bewitching. About driving in Maryland. On roads with more than one lane in each direction, Maryland drivers tend to do about 70 mph no matter the speed limit, and I saw 55 and 65 mph speed limits. The one exception was on the 50 mph speed limited Bay Bridge where they tended to do about 60. In rural, eastern Maryland (the "Eastern Shore") on two-lane roads, locals tended to go 5 mph under the speed limit or, at best the actual limit. Thanks for sharing the reviews of luxurious cars. Monthly Car Rental Montreal from where you can get luxurious car on rental at the reasonable price.